The northern forests of North America are called boreal forests and are made up mostly of evergreen trees. Evergreens have green needles instead of leaves, and the needles stay on the trees all year round. The southern forests of North America are mainly deciduous forests, made up of trees that leaf out in spring and drop their leaves in fall. 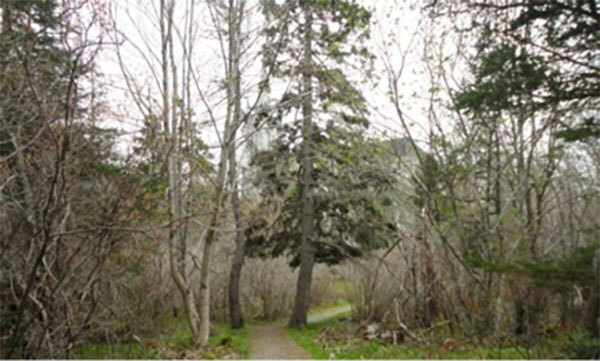 Le Petit Bois is part of a different forest type – the Acadian Forest – covering Nova Scotia, New Brunswick, Prince Edward Island and south as far as New York State. This zone contains a mixture of both deciduous and evergreen trees. 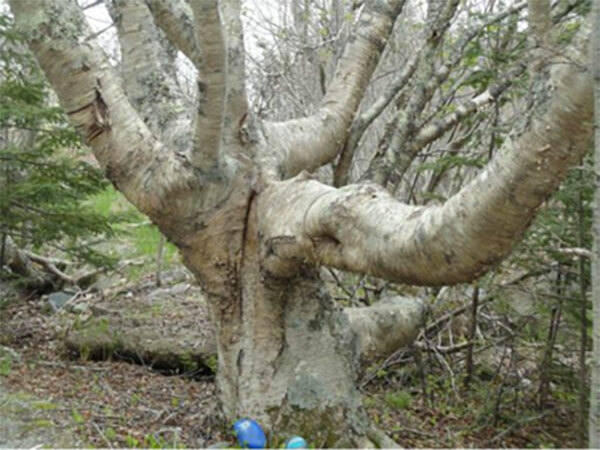 The Acadian Forests have the largest variety of tree species: usually a mix of spruce, pine, birch, maple, beech and hemlock creating a leafy canopy overhead with an undergrowth of ferns, smaller flowering plants and alder bushes at ground level. It is the home of a large variety of birds and small mammals such as shrews, squirrels and the Snowshoe Hare. When the Acadians settled in this area after the Deportation in the late 1700s, it was very densely covered with Acadian forest. The Acadians had been farmers before the Deportation and they were, at first, discouraged by the lack of good farmland. They used the wood from the forest for constructing buildings, as fuel for heating, for boatbuilding, and also to sell as an export product. They became known as very capable woodsmen, skilled sawmill operators, good woodworkers and excellent boat builders. The Acadian Forest became a very important part of the economy of the region. 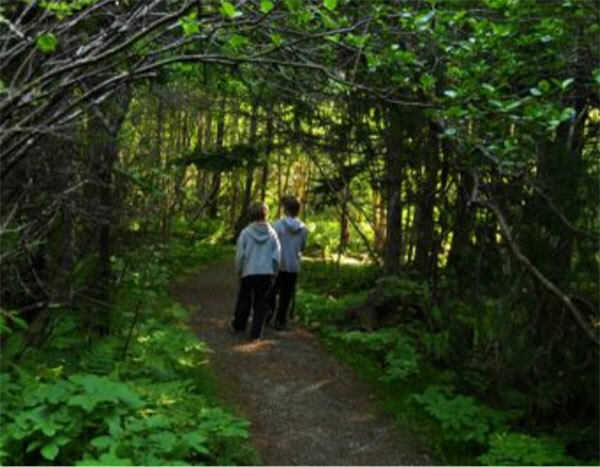 But, there is something even more important about the Acadian Forest than its economic value …like all forests everywhere, the trees take in carbon dioxide and produce oxygen for us to breathe. 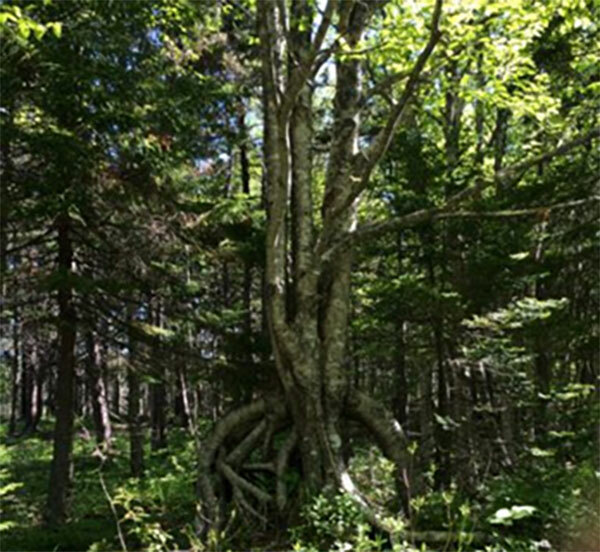 The Acadian Forests have been called the ‘lungs of the Maritimes’. We could not survive without them. It is very important that we conserve our forests and manage them wisely. We hope you enjoy the fresh air in Le Petit Bois. A grove of mature yellow birch trees stands in the northern part of Le Petit Bois. Most people are very familiar with the white birches, or ‘paper’ birches, with their straight growing form, modest size and short life span. The yellow birch, on the other hand, can live for many hundreds of years and grows to an impressive size. In most forests, yellow birches are harvested for use in cabinetmaking, furniture and flooring. It is rare to see a fully mature yellow birch. They have massive trunks and very muscular looking limbs that spread out in all directions. In Le Petit Bois, one grove of yellow birch can be seen along the paths near the playing fields and church on the northern edge of the campus. One very impressive yellow birch can also be seen on the path near the entrance to Le Petit Bois located to the west of the cafeteria building. Birches sometimes have the peculiar habit of ‘growing on stilts’. They grow from a seed that sprouts on the top of a rotting tree stump, using the stump for nourishment, and growing roots around it at the same time. Eventually the old tree stump disappears completely, and the new birch tree is left with long roots reaching the ground. There is at least one birch tree on stilts in Le Petit Bois, see if you can find it!